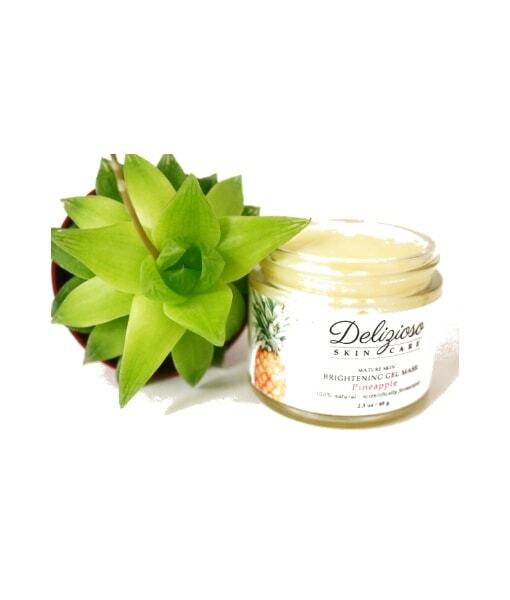 This 100% natural luxurious Brightening mask is formulated with Pineapple enzymes to help leave skin looking softer and more radiant after use. This mask is targeted to leave skin feeling more energized and supple. Directions: Apply a thin layer to clean skin. Slight tingling is normal with this mask as it works to brighten and exfoliate the skin. Leave on 15*20 minutes or until mask is completely dry. For the first three nights, use nightly. After the third night, use 2*3 nights per week. Directions: Apply to face while gently massaging. (* = Certified Organic) Ingredients: *Aloe Barbadensis Leaf Juice, Xanthan Gum, Maracuja (Passionfruit) Oil, Ribes nigrum (Black Currant) Oil, Prunus avium (Cherry) Kernel Oil, nanas Comosus (Organic Pineapple) Fruit Extract, Cocos nucifera (Coconut) Milk, Papin (Papaya) Extract, Preservative (Vitis Vinifera (Grape) Seed Extract, Populus Tremuloides Bark Extract, Leuconostoc /Radish Root Ferment Filtrate, Sambucus Nigra (Elder) Fruit Extract). (* = Certified Organic) *Aloe Barbadensis Leaf Juice, Xanthan Gum, Maracuja (Passionfruit) Oil, Ribes nigrum (Black Currant) Oil, Prunus avium (Cherry) Kernel Oil, nanas Comosus (Organic Pineapple) Fruit Extract, Cocos nucifera (Coconut) Milk, Papin (Papaya) Extract, Preservative (Vitis Vinifera (Grape) Seed Extract, Populus Tremuloides Bark Extract, Leuconostoc /Radish Root Ferment Filtrate, Sambucus Nigra (Elder) Fruit Extract).